I had heard about Ahmad Al-Qloushi before -- the Kuwaiti student whose college political science professor in California failed his pro-US paper and told him to get psychiatric counseling -- but until I read this post at the Rottweiler, I didn't know I could actually read Al-Qloushi's essay. The English teacher in me was intrigued. A lot of people in the 'sphere, political science profs included, said they also would have given the essay an F. Several commenters have expressed the idea that if a student can't perform at a higher level than Al-Qloushi, he has no business being in college. That brings up a very delicate issue that I struggle with every day. The university I work for is specifically designed for soldiers. There are no requirements of any kind for entrance, other than a high school diploma or GED. No ACT, no SAT, no high school transcript; if you want in, you're in. Some of our students are very bright, others are not. Some want to get an education, others want promotion points and couldn't care less about the content of the class. Some, I hate to say, probably have no business being in college, but they are. So when I grade their essays, by what standard should I grade them? By my own, based on my classes at Truman State University? By a universal standard of Perfect Writing, as if that exists? Or by the standard of other students and how they match up to each other and what we've learned in the class? I generally have taken the latter approach, for better or for worse. I don't know of any other way to grade them; I walk the fine line between grade inflation and concrete benchmarks every day. I teach them structure, and if they follow it (or attempt), they do well. My students do not leave my class thinking like Den Beste or writing like Lileks, but hopefully they leave my class a little better than they came in. Ahmad Al-Qloushi's essay ain't the greatest in the world. But I've seen far, far worse in my classes. He was also attending a junior college, not a top-rated university, which is where many of his critics work. I'm not saying that he deserved an A, only that perhaps his peers' papers weren't much better. He'd fit in perfectly in my class, where I have many non-native soldiers who write quite poorly. Hell, even my American-born soldiers make the same grammar mistakes Al-Qloushi made. I'm not trying to justify a grade either way for this student, since I'm not a political science professor, but I can't help but wonder what the rest of the class' essays looked like. Were they similar, and thus did they also fail? 3 I've read the essay. I'm afraid I would have flunked it too. Although while I teach at a junior college, I teach comp sci. My main beef, and the reason I agreed with the professors who flunked him, had little to do with grammar. The essay did not adress the topic. The topic essentially required the student to show how the formulation excluded the majority of the people living in America at the time. The arguments the student presents are all based on rhetoric, are not backed up, and don't address the question. I teach comp sci; if you submit a beautiful program that doesn't solve the posed problem, I will assign an F.
4 You bring up a relevant point. 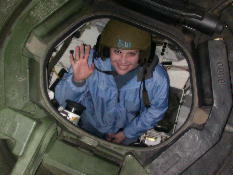 As a soldier in Korea, I attended U of Md classes at the Yongsan Garrison (Seoul). They had a disparity of student levels, and both American and non-American students. I appreciate the teacher's dilemma of shaping a grading policy in a class with a wide range of abilities and motivations. My English instructor in Korea, David Norris, is the best professor I've ever had, Columbia University profs included. On the other hand, a standard is a standard, and a student isn't helped when a training/education standard is not enforced to, well, standard. Hypothetically, what if I attended a class where the standard was anti-Americanism? I can certainly write a paper critical of some aspect of my country, but I'd drop any class that compelled me to write an anti-American propaganda piece. 5 What if all of your students write poorly  does the one who misspells the fewest words get the A? Your dilemma intrigues me, because of some debate I had last semester with fellow students. We were in our late 30s to early 50s, and all were working cops in a degree completion program. The students were similar to the soldiers in your classes as to the range of their abilities and why they were attending school. The few that were griping because they did not consider it challenging enough were targeted for abuse by those who just wanted to graduate. 6 I got an A on an English essay that didn't properly address the question way back in my Freshman English class but the teacher made me come to her office so she could explain that she had to because my writing was so far above the class level, but she was only going to give me one pass and next time please to answer the essay question. ;-) What I wanted to mention, though, was that when I was in college I noticed that quite often foreign students had a real problem with the concept of arguing a point they disagreed with. I think it feels like lying. My mom told me when I went off to college that there wasn't anything wrong with answering a question the way a teacher wanted it answered. If I recall the essay question it was asking to show how a certain thing was true, that the question itself assumed a particular outcome. With my mother's wonderful advice I'd put a lot of "so-and-so postulates that" and "so-and-so argued that" and lay out the answer as an opinion and spit back out what the teacher wanted to hear. Did he have a choice of answering other essay questions instead and were those questions similarly slanted? I homeschool my children and in my research about how children learn and my contact with other home educators I found that some children find it next to impossible do timed math tests because guessing feels like lying, answering a question knowingly falsely. I'm not saying it's so, but I would suggest the possibility that it's not academic ability that is the problem but either a personal, or cultural, inability to do what amounts to a complicated process of responding contrary to personal belief that most people do automatically. 7 It seems to me that if you're advertising yourselves as offering a university education, offer a university education. Just because you don't filter people out doesn't mean that they all have to pass. Really, is it worse for them to flunk out than to never even get the chance to try? Should a real university education only be offered to those that meet admissions standards? Why? A university degree has value only because you can't get one without demonstrating competence at college level work - if the work gets easier, the degree gets less valuable. My husband's brother returned from Iraq safe and sound yesterday. Just a short six weeks until both boys are home. And, in honor of the boycotts, yesterday I spent money on a Kitchenaid mixer, Bill Whittle's book, a TV/DVD for our education center, and a trip to Fort Lauderdale. Take that, protestors! 1 I suspect the "Buy Nothing" boycott was basically countered by those that support Bush, or at least by those who are just getting on with their lives. 2 Okay Sarah, for that purpose I will approve ANY mixer or appliance you want to buy!!! I do wonder if others spent extra money just to make a point. The other English professor here offered to lend me a publication he uses in his classes that is a compilation of outstanding essays from incoming freshmen at Loyola University. It seemed like a good idea, but I just flipped through the entire thing, and I don't see myself reflected in any of the essays. Not a one. I don't see myself in essays entitled "Reagan-Era Backlash" or "A Socially Unjust Relationship in Wartime America" or "Dissenting Patriots." I don't hear my voice in essays about how money is the root of all evil, how war is always bad, and how the American Dream is "a prevalent [idea], but not a realistic one." And I sure as hell don't want to read an essay about how the 9/11 terrorists were acting under their own sense of justice, thus we can't judge them since justice means different things to different people. Plus I'm pissed off that the prof who lent me the book has dogeared the page on the essay "The Unjust Aspects of U.S. Foreign Policy." There's not a single voice in this book that speaks to me. There's not a single incoming freshman I can relate to. I keep thinking about that kid from Protest Warrior and getting more and more depressed, knowing that his is a lonely voice. 1 Perhaps you could loan this prof your copy of Atlas Shrugged. The one with a big heart drawn around the sketch of Ayn on the back cover and a lipstick kiss on the front. In his comments, Kerry also compared the democracy-building efforts in Iraq with voting in the U.S., saying that Americans had their names purged from voting lists and were kept from casting ballots. Like my brother. Who would've voted Republican. I finished reading The End of Racism the other day, just in time for Martin Luther King Day. I've been thinking about the content of people's character lately. I don't care what color someone is as long as we can find some common ground. I have common ground with Baldilocks, Amritas, Vinod, and Zeyad, and we're all different colors. (Conversely, I have little in common with Wonkette, and we're exactly the same shade of pale.) Blogging is the great equalizer: often you read someone for months before you figure out what they look like, but it doesn't matter because relationships are based on ideas and brains instead of looks. CavX could have three eyeballs, and I wouldn't even care. I'd say that the military is about the least racist place you can be. The Army discriminates on rank, not color, and there's so much intermarriage and living side by side. Everyone has the same experience in the Army, regardless of color. And my husband joked once that where in the civilian world could most of his big bosses be black (like his COL and MAJ were at the time). Unfortunately though, there are still a lot of people who feel the thumb of racism. Many of my black students write their essays on black issues, on racism, on discrimination. I wish sometimes we could move beyond those issues. I wish we could make it to "the end of racism." I just have a hard time trying to grok why we can't. Eric posted MLK's essay War and Pacifism over at Thank My Recruiter. We're fighting a war now against people who want us dead because of the content of our character. They want us all dead, black and white. We need to find our common ground and band together to protect our country's character. Apparently in 1970 there was a popular comedy show in the USSR patterned off of Laugh-In. So Laugh-In dedicated an episode to making fun of the Soviet version of the show, creating a Soviet "party room", Soviet jokes about the past and lack-of future, and a crappy looking wooden wall that they told Soviet knock-knock jokes from. Hilarious stuff. They were poking fun at the bad guys in WWIII. It's too bad times have changed; we're not even supposed to suggest that there is an enemy in WWIV. Apparently in the show 24, the terrorists were portrayed as...horrors...Muslims. CAIR said it called for the meeting Wednesday -- which included representatives from CAIR's Southern California office and from the Los Angeles-based Muslim Public Affairs Council -- to "address the depiction of a 'Muslim' family that is at the heart of a terror plot in the popular program." The Washington, D.C.-based group said it was concerned that the portrayal of the family as a terrorist "sleeper cell" may "cast a shadow of suspicion over ordinary American Muslims and could increase Islamophobic stereotyping and bias." CAIR's statement today said that in addition to distribution of the PSAs, "FOX also gave meeting participants assurances that the program will be balanced in its portrayal of Muslims. Network representatives said that they had already reviewed existing episodes and removed some aspects that could potentially be viewed as stereotypical." Thirty-five years ago, Laugh-In made the joke "Vy is the chickenk crossing de road? To defected to Poland, but he'll be back!" Today we're not even allowed to make-believe that the people we've been fighting for four years could be the bad guys in a drama. Heaven help us. 1 CAIR doesnt get it. In WWII, the Germans (and Japanese and Italians) were the enemy. We had loads of naturalized germans in america but we didn't mow them down in the streets and in their homes. Lots of Germans came to America because they knew that Facism was not going to make their country a place they could live. In WWIII lots of Russians came to America because they knew that Communism was not going to make their country a place they could live. Now, in WWIV, lost of Muslims come to America because they know that Theocracy is not going to make their country a place where they can live. CAIR needs to get off their high horse and start doing something constructive other than kvetching about how America hates Islam. As an English professor, I walk the fine line between prescriptive and descriptive grammar. I'm a descriptivist, so if I were the only English teacher my students had to deal with, it wouldn't be such a big deal that I just ended that clause with a preposition. But the students leave my class and move on to a prof who studied in England and is much more prescriptive than I (or should I just go ahead and say "me"?). I don't care if they use contractions or end a sentence with the dreaded preposition, but he might. Funny story: I once saw a student in my Swedish class insist to our teacher that you can't end a sentence with a preposition. She was horrified that you can do that quite comfortably in other languages and not feel the wrath of your 5th grade teacher. We say things all the time that are completely comprehensible but grammatically wrong. So what makes them "wrong" if we can understand them? Why do I bother pointing out all the places my students need the past perfect tense in their narrative essays when nine times out of ten it makes no difference for understanding the story? Why is it like fingernails on a chalkboard to me when my students use the wrong relative pronoun, when no meaning at all is lost? Why do I even bother reminding them that "between you and me, he is taller than I"? One of my German friends heard something on the TV that she was convinced was wrong. She was flabbergasted to learn that "It is I" is correct. I'm sure she's never heard it before. Another German was mad to learn that "Me and my husband are going on vacation", though common, is incorrect. They don't hear the prescriptive versions very often. So what's a girl to do? For now, my strategy has been to refresh my students' memories on the prescriptive versions, all the while with the caveat that languages change and that someday "It is I" will likely be considered wrong since virtually no one will be saying it. But for now they have to sit on the cusp of language change, like it or not. 1 Teach them correct English. It will help them to learn other languages more easily, and they'll feel more at home reading people like VDH and WFB. 2 I used to think the Catholic Church needed to change it's beliefs to be more in sync with the age. The liberals all talk about the Constitution as a living, breathing document to change with the times. I disagree with both premises today because I now can see what that damage inflicted by not appreciating or following old rules or laws. This is also the same reason why I don't support state sponsored homosexual marriage. How would this evolve 30 years down the road? Same goes for language/word usage. Unintended consequences. 3 [But the students leave my class and move on to a prof who studied in England and is much more prescriptive than I (or should I just go ahead and say "me"?)] Well, in this case I would just add the "am" after than I. It really bugs me to hear someone use I and me incorrectly. I have no degrees, it just grates on my ears. There are several other things that bug me a lot lately, like the always present tense used in local and cable news. IF it happened in the past, and anything in the news did, unless it is an ongoing situation, it is in the past and past tense is really easier to use. I expect any day now to hear "like, he goes....then I go" on the news! 5 Introduce such people to "The Mother Tongue" by Bill Bryson. Oh. My. Lord. Michael Tucker reads my blog. Why anyone reads my blog I'll never understand, but this is huge. Who the heck is Michael Tucker? Only the guy who filmed Gunner Palace. That's all, no big whoop. Anyway, gathering self, Tucker is upset that his film will be given an R rating. Yep, soldiers cuss. Tucker humorously quotes General Patton: "You can't run an army without profanity. An army without profanity couldn't fight it's way out of a piss-soaked paper bag." He also alluded to a recent editorial by Jack Valenti about how some ABC affiliates didn't show Saving Private Ryan because of the swear words. But there are swear words and swear words, and never the twain shall meet. One of my students and I had a long discussion over the summer as he was trying to gather ideas for his paper on the FCC. One of the things I brought up was how lots of naughty ideas can be expressed without using swear words. The examples I gave him were two songs: "What's Your Fantasy" by Ludacris and "The Bad Touch" by Bloodhound Gang. These songs get played all the time on the radio, but they allude to things far more explicit than the f-word alone would conjure. There are no swear words in "whips and chains, handcuffs / smack a little booty up with my belt" or "love, the kind you clean up with a mop and bucket / like the lost catacombs of Egypt only God knows where we stuck it", but they sure put some images into your mind! You don't need swear words to be explicit. Conversely, you don't need to be explicit to have swear words. The swearing in Saving Private Ryan is a fact of life. Put 20 men in a life-threatening situation, and you're going to get some colorful language. But it's different than the swearing in a movie like Clerks -- which is also a fact of life but is there for humor -- or the movie Team America -- which I swear Parker and Stone use just to make people mad. The swearing in Gunner Palace is a reflection of reality; it's surely not meant to be titillating like scripted swearing. When the WTC came crashing down, and the media was recording history in the making, we all heard swear words uttered in fright and horror. Do our children remember that day as a tragic moment in American history or the first day they heard the s-word on TV? Somehow I doubt that's the most important part of the story. The most important part of Gunner Palace or Saving Private Ryan is not that some GI used the f-bomb, but that some GI was there making history. 1 Playing devil's advocate, the MPAA really doesn't have much wiggle room on how to apply ratings: "A film's single use of one of the harsher sexually-derived words, though only as an expletive, shall initially require the Rating Board to issue that film at least a PG-13 rating. _More than one such expletive MUST lead the Rating Board to issue a film an R rating,_ as must even one of these words used in a sexual context. These films can be rated less severely, however, if by a special vote, the Rating Board feels that a lesser rating would more responsibly reflect the opinion of American parents." I think it's fairly safe to say that children watching this film might come to emulate what these American heroes do and say. That is precisely why we have the ratings system in place, so 13 year olds don't think it's OK to run around dropping f-bombs everywhere. 2 Have you seen this film Sean? I have seen Gunner Palace at the Toronto Festival and I think every american kid should be allowed to see this before she/he meets a US Army recruiter at hightschool (which usually happens a before they're 17!!!). 3 Why do people read you? You are exotic. An English teacher who likes tanks. That is a whole movie right there..... M. Tucker take note. 4 No, I have not seen the film. Then again, I'm not quite sure what that has to do with the MPAA's ratings system. 5 That's amazing, Sarah. I'm still looking forward to seeing Gunner Palace. If you wear a Swedish flag on your clothing in Sweden, it means you are a neo-nazi. I was utterly shocked when my friend taught me that when I lived there. (This knowledge is echoed by singer Maja Ivarsson here, so it's not just that my friend is crazy.) I can't imagine what it must feel like to be ashamed of your flag. Apollo 11 just landed on the moon: it was amazing. I only wish I had seen the original. And I realized today how freaking cool it is that there's an American flag on the moon. Had we not landed there until 2005, there would be no flag, but we landed in 1969, when it was still OK to think the United States was the best country in the world. My husband hates the inclusive "we": I certainly had no hand in the moon landing, so I shouldn't put myself in Armstrong's pocket. But I've inherited the mentality that pushed the US to be first. I've inherited the vision that NASA embodies. I've inherited the drive that made Americans work their asses off for ten years simply to go and walk around on a hunk of dust. I'm a product of past determination and success. There's an American flag on the moon and millions of dollars of equipment floating around in space because Americans decided they were going to the moon. I'm proud I inherited that history. Post contains 241 words, total size 1 kb. 1 I was visiting my sister in Houston during the moonwalk. We kept our children up late so they could see it and remember for the rest of their lives. They do. And then the biggie, we went to the parade when the astronauts came home. I don't think my sister and I have ever been so excited as we were to get personal nods from the heroes as they rode by. We were in heaven. Starstruck young mothers, we were thrilled by the whole idea. It is still a big accomplishment, maybe not necessary but still a big one. 3 As I watched it live on television, I kept walking outside to look at what I rememeber to be a nearly full moon. I wanted so much to be able to see some sign of them on that thing. 4 Hmmm, I was born in '68. The only thing I remember is watching Vietnam on the tiny B&W tv my parents owned. Stupid MSM. 5 I remember the Moon landing vividly...snuck away upstairs to watch it with my then girlfriend. My main comment is regarding the display of flags. This fall we had a German exchange student. A nice kid with exactly the political ideology you'd expect. During one of our several political discussions we touched on the display of the American flag. He thought it very peculiar, and said that in Germany anyone who displayed the German flag was looked upon as a Neanderthal, a throwback to times long gone. He didn't refer to neo-nazi connections, but it was still a very negative thing. We live in strange times! 6 Jim -- you just reminded me of something. When I went to live with my Swedish friend, her parents bought one of those little American flags on a stick and stuck it in a flower arrangement on the table. I thought it was cute and thoughtful, especially since I was in Sweden for 4th of July. Well, now my Swedish friend is dating a German, and her parents wanted to get a German flag for the centerpiece when he came to visit. He told my friend that he did not want them to display the German flag, that he would rather have the flag from Hamburg (his hometown) or nothing at all. The flag from his city? As an American, that sounds totally bizarre, but that's his reality. He doesn't feel a "German" identity. 7 I could understand how Europeans, fresh from the despoliation wrought in WWIs and II, might not embrace nationalism quite as fervently as Americans seem to do these days. IG Farben, wrapped in patriotism, annealed with the corporate 'rationality' that produced Zykon B, might put a shade of doubt in one's patriotism. Or the battlefield of the Somme, viewed from space, might be sobering. Funny that those who delivered this insight: http://setiathome.ssl.berkeley.edu/pale_blue_dot.html, and this: http://www.nasa.gov/multimedia/imagegallery/image_feature_102.html, would fail to grasp their lessons. Sort of like the Chinese inventing, but not exploiting gunpowder: a puzzlement. As to the United States being 'first', as I recall, it is last, at least amongst industrialized countries, in just about every index of social well being. It is, however, first, but more than merely first, for it is bigger than the next 10 or 20 countries combined, in one thing...arms manufacture. And, significantly, the US is first in per capita imprisonment of its population. Puzzling also is that the US was the country that first implemented the idea of a secular government, of strong separation between church and state, and yet now seem eager to abandon this. Fresh off of the sectarian 'abatoir' that was 17th century Europe (one student of the L'Ecole National D'Administration, France, said to me "the protestants were stacked like cordwood..."), groups that settled the eastern seaboard of the US, among them the Puritans, who themselves had fled religious persecution, gave the world an innovation that fundamentalist Christians and the Taliban-like devotees of Islam would do well to rediscover: secular government. Ah, but the pull of nostalgia, the warmth and uncomplicated amnesia that solidarity with ones group gives; these do comfort, and do blot out the, shall we call them, ironies -- Hussein and Mosadeq being most relevant here, but let us not forget Rios Mont, D'Aubisson, Pinochet, the Shah Reza Pahlevi, Ortega, Galtieri, Somoza, Diem, Park -- of history. And back to the mire that is Iraq, where the Americans, with their newly redisovered zeal for 'democracy,' find themselves buried axle-deep, here is a quote from an earlier imperial entanglement, coincidentally exactly there on the Tigris/Euphrates, where shortly after the France and Britain rushed in to fill the void that the disintegration of the Ottoman Empire after WWI had left, this happened: "The mysterious uprisings in Iraq threw the normally poised British Indian administration off balance. Sir Arnold Wilson told the Cabinet at the end of 1920 that 'there was no real desire in Mesopotamia for an Arab government, that the Arabs would appreciate British rule.' If that were so, then the explosion in Mesopotamia could not be explained as an Arab independence movement. 'What we are up against,' said Wilson, 'is anarchy plus fanaticism.'" --A Peace to End All Peace David Fromkin 1989 And how well are the Americans equipped to deal with the internecine tribal, ethnic, national, and imperially-afflicted world that they now are enmeshed in? Here is a telling bit of information: "Despite the threat of war in Iraq and the daily reports of suicide bombers in Israel, less than 15 percent of the young U.S. citizens could locate either country. "More young U.S. citizens in the study knew that the island featured in last seasons TV show 'Survivor' is in the South Pacific than could find Israel." Source: National Geographic web site, October 2004 Nevertheless, having said all of this, I would serve were I called. Such are the contradictions of love of country, and devotion to democracy, tainted though the United States' is at this moment. One last note: if you haven't seen it, I highly recommend Bruce Beresford's film "Breaker Morant." It truly does nail down the contradictions that imperial adventures produce. Certainly, adding some relief to the relatively black and white attitudes (I hesitate to call the debased political environment that prevails in the US 'debate') could only help. 8 Nobody is trying to abandon the First Amendment. It does NOT state anything about separation of church and state, but simply that Americans are free to practice their religion without government interference. Quite a difference. 9 And "Breaker Morant" is an excellent film. It has more to do with politics and diplomacy than anything else. Try watching it again. 10 RSS, respectfully, Please provide a cite for this: "As to the United States being 'first', as I recall, it is last, at least amongst industrialized countries, in just about every index of social well being." And also, if you can find any examples of this: "Puzzling also is that the US was the country that first implemented the idea of a secular government, of strong separation between church and state, and yet now seem eager to abandon this." I have not seen any local, state, or federal proposal to establish an official religion in the US. Try to come up with examples of a religion being forced onto an unwilling public, then for counter argument find examples showing religion forcibly removed from the public sphere. Then there is this: "newly rediscovered zeal for 'democracy,'" Is democracy promotion a bad thing? If we take your statement to implicitly mean that we are now promoting democracy in Iraq, please explain how this is an attempt to establish an empire? For bonus points, if possible, explain which territories the US now holds under imperial control reminiscent of the French and British empires. Could you please state which demographic group you are referring to in this statement? 'Young' is rather ambiguous. "Despite the threat of war in Iraq and the daily reports of suicide bombers in Israel, less than 15 percent of the young U.S. citizens could locate either country" Also, for cross referencing, could you also cite the same demographic from non-US countries and their abilities to answer the same questions. "having said all of this, I would serve were I called." Very commendable. 11 John, The US is likely to lag behind other developed nations in many key categories. Why? For a variety of reasons. We have high immigration from undeveloped nations. We count and track everything, good and bad, without sweeping anything under the rug. The US does not abandon and forget anyone, we try to educate everybody, and we test everybody. Here is a real world example. Cuba has a lower 1st year infant mortality rate than the US. Interestingly, the US has (per capita), more very low birth weight infants born than Cuba, even though our numbers are similar in the other birth weight categories. Why? Probably due to older women having babies, fertitily techniques, American doctors trying to save premies, and counting premies as live births. So yes, the US has a worse 1st year infant mortality rate, but I'd be willing to bet good money that the US has a higher percentage of pregnancies result in live births than Cuba. Byna, statistics lie. 12 When compared to other industrialized countries, the US consistently falls in the bottom quartile or decile in most indices of well being, and has been falling in rank for decades. In defense spending, however, the US is number 1 in nearly every category except for absolute numbers. The US suzerainty in matters military has been matched in widespread violations of human rights. Often, however, the US relies on proxy states to control over its sphere of influence through coercion at many levels -- juridical, diplomatic, economic, military. State societies of imperial reach (i.e., those that exert control over a geographic region that is continental or global in scale) display similar tendencies. [Unable to locate citation for this quote]: "[US] ranks in the bottom quartile of a list of 29 industrialized nations in both life expectancy and infant mortality and its relative ranking in both these categories has been declining since 1960. "Of all the G7 countries (U.S., France, Germany, Japan, Great Britain, Canada and Italy) only the U.S. has not achieved nearly universal publicly mandated health insurance coverage." http://coat.ncf.ca/our_magazine/links/issue41/articles/myth_or_reality_america_is_number_one.htm [From groping around on the web a bit, most of these stats. seem to come from a 1999 OECD report. The above site doesn't provide citations. This kind of country ranking, is however, abundant.] "[The US is] Number one [amongst industrialized countries]: â¢ proportion of children living in poverty (one in five) â¢ number or children who have no health care (ten million) â¢ proportion of children living in single-parent families (one in four) â¢ number of children dying from gunshot wounds (15 per day) ... Health care (among nineteen industrialized countries) Number one in: â¢ percentage of population without health care coverage â¢ lack of provisions for paid maternity leave â¢ percentage of pregnancies ending in abortion â¢ rate of infant mortality (death under five years of age) and percentage of infants born with low birth weight â¢ percentage of preschool children not fully immunized 'incidence of cancer among young men, and breast cancer among women "Environment Number one in: â¢ emissions of air pollutants per capita 'contribution to acid rain, ozone depletion and global warming â¢ garbage per capita and junk mail per capita â¢ hazardous wastes "Social (among nineteen industrialized countries) Number one in: â¢ number of billionaires â¢ wealth and income inequality (15th in percentage of total income owned by poorest forty percent of population) ... â¢ private spending on education (number 17 in public spending on education, 11th in years of full-time compulsory education, 15th in number of scientists and technicians per capita and nineteenth in main proficiency scores on international standardized tests) â¢ in big homes and homelessness â¢ in net indebtedness (19th in national savings as percentage of COP) â¢ in bank failures and bank bailouts â¢ in pay inequality ratio of average executive salary to average worker (Ii 5th in average female wages as percentage of average male wage) â¢ percentage of population who have been a victim of crime â¢ murder rate. reported rapes and murder of children a death by guns, deaths by capital punishment and percentage of unsolved murders (14th in percentage of murders solved) ... â¢ number of Jailed prisoners, drug crimes per capita, drive-by shootings. road rage Incidents, carjackings Military (U.S. rank among 180 countries) â¢ military expenditures: 1 ... â¢ greatest number of invasions made not authorized by the U.N. â¢ military expenditures per capita: 3 â¢ most consistent negative voting on arms control and disarmament..."
13 I feel compelled to add a couple of qualifications to my remarks, given the polarization of political discourse in the US. I support the idea of an apolitical military, subordinate to civilian authority. Those who serve, should, therefore, receive our sympathy and support, and I offer these, as well as grateful thanks, to the author of this blog, to her husband, and to his fellow soldiers. Regarding the US role in Iraq and the world: I do not believe a hasty withdrawal from Iraq is in anyone's interest. We have a long difficult, and most likely tragic road ahead of us. I don't think we should delude ourselves that we will end up with pluralistic democracy of the western kind in Iraq. With the laudable though misguided goal of preventing Saddam Hussein from using weapons of mass destruction, we have stumbled in a mire of sectarian, ethnic and tribal disputes; and these are compounded by a colonial and imperial legacy stretching past the Ottomans, of which US involvement is only the most recent chapter. Anti-western fundamentalists are joining with Sunnis and Baathists to undermine elections that will likely install a Shiite-dominated government. That one line alone could be parsed and perceived dozens of different ways, but it should give a bare taste of the complexity of what we face. It is critical that the US attempt to understand Iraq's history and society, and that we subordinate our desire for security to the desires of the international community, and to the rule of law. In pursuing security, we should not abandon ourselves secular government, habeas corpus, due process, fair elections, and the rule of law. Again, I offer my heartfelt sympathies to those who are serving in Iraq. Nothing can adequately express the gratitude that I feel for your service, and for the sacrifice that you are making. 14 You probably weren't born yet but in 1968 when I returned from VN I found an American flag decal inside a Readers Digest magazine. I stuck it on my car window and whooboy did I come on some @#$% on campus. Up till then I had been getting the v peace sing-fingers salute once the flag went up I received the single digit expression of f--yourself. 15 RSS, Please explain to me why that the large majority of the people in the world who are looking for a better life than the one they have want to come to the US. If we are the leaders of the world in dead and poor children (within your narrowly defined guidelines) why do we have people who want to come here to have children and raise families? Why do they not stay where they are? For every single statistic you mention that we are so horrible, why in those specific areas does the rest of the world flock to our shores to benefit from those things we are so bad at? Research, science, education, business. This is the country that leads in results in all catagories, and using cherrypicked limited statistics to refute that only makes you a victim of self deception. Rather than attempt to beat down this country and drag it through the mud, work on improving the country, and lying with statistics is not improving anything. This weekend I also caught a John Wayne double header: Rio Bravo and El Dorado. (I didn't leave the couch much, being sick and all.) Um...is it just me, or are they the same movie? How did John Wayne get away with that? Sheriff gets dumped by a girl, sheriff turns into a drunk, The Duke sobers him up, everyone jokes that he needs a bath, the fresh new sheriff catches the bad guy and puts him in jail, the other bad guys try to bust him out, they capture one of the good guys and offer a trade, there's a shoot-out, John Wayne wins. Oh, and there are two sidekicks: a young whippersnapper named after a state, and a crotchety old man who guards the jail. Of course I loved them both, because who doesn't love John Wayne (plus Ricky Nelson and James Caan), but that's the same freaking movie. 1 Yes, they are the same movie. A lot of people complained when it was released (I'm so old! ), but it was JOHN WAYNE, BY GOD! There are no John Waynes in Hollywood any more, and there used to be so many who shared his views, if not his bravado. 2 John Wayne wanted to play the drunk in the second movie but "they" wouldn't let him. The major actors in El Dordo all knew it was basically the same movie as Rio Bravo...but I think they did it as a favor to the director. 3 is that the one with Bob Mitchum? My neighbor thrust the series From the Earth to the Moon into my hands and urged me to watch it. The last thing I need in my life is another four DVD box set, so I reluctantly opened it today while I was home sick from work. I have been loving every minute. I'm glad that my knowledge of the space race is scant, so each episode has a surprise ending for me. I have been thinking about the similarities and differences between military and astronaut wives. I have been thinking about the technology race with the Soviets and how it's the last time we've had real competition as a nation. I've been thinking about how this competition drove us to put a man on the moon in a decade, which should have been unthinkable and often was dangerous. I've been thinking about all the poor astronauts who aren't named Aldrin, Armstrong, or Glenn and how underappreciated they are. I've been thinking and getting goosebumps all evening, and I highly recommend the series if you have the chance to see it. 2 Ahhhh. My favorite DVD set. I don't let anyone touch it, I'll load it into the player, thank you very much. I'll admit it, the whole thing makes me cry. 3 Perhaps the pinicale of man's acheivement, and you grew up knowing very little about it. That is sad...and an indictment of our school systems here in this (USA) country. They don't teach enough history! One of my greatest fears is my grandchildren will grow up not believing that man actually set foot on the moon. "Now grandpa, you know it didn't really happen!" 4 Apparently they don't teach spelling either, because I let a couple slip through...that's what happens when you get used to Word Spellcheck! I thought I should say something about the kerfluffle over Kid Rock playing the inauguration, but there's nothing else to say except I'm all fer it. Kid Rock understands the threat of terrorism, he split with his friends when they went to see Fahrencrap 9/11, and he's performed in Iraq because he loves his country. I do think there is something larger at work here. Many of the bloggers who disagree with Michelle Malkin have discussed the future direction of the Republican party. I think this Kid Rock dilemma is indicative of the split between the old timey GOP and the South Park Republicans. We're at a bit of a crossroads here, and the decision over whether or not to include Kid Rock is nothing to sneeze at. I know that the GOP isn't just fat rich WASPs, but that stereotype still exists for many on the Left. Kid Rock's inclusion at the inauguration could do a lot to break down that stereotype and show young people that it's OK to be a Republican. 1 Sarah - I agree. Kid Rock has made countless trips to support our troops in theatre. Regardless of the music he makes, he gets 'it'. I think people who would try to stop him from performing are hypocrites. Let'em play. I love the South Park episode where the boys get arrested for downloading music and Lars Ulrich is crying because he has to save up before he can get his gold-plated shark tank bar installed next to the pool. According to Hud, music sales are up. There are two things I don't understand about the Napster hullabaloo. First of all, why don't book authors try to ban libraries? I mean, hundreds of people can just walk in there and read their books for free. Why don't authors get their underpants bunched about book swapping? And secondly, I have bought several CDs this past year, but all from sites like half.com or the Amazon market. The artists don't make any money when I do that either. Why would they freak out if I can download one song for free, when I could get the entire album for $3.70 from someone else and not give them a dime? If it's really about losing money for artists, why aren't they concerned about losing money in other ways? What about music clubs where you get 10 CDs for a penny? Don't they get less money that way too? 1 Your "questionable content" filter needs some work, dear. 3 They have tried. John Cougar Mellencamp led an effort to get royalties from used cd stores in the late 80s early 90s. We still have not settled the physical media/intellectual-artistic content argument over ownership yet. 110kb generated in CPU 0.77, elapsed 0.7224 seconds. 57 queries taking 0.4844 seconds, 241 records returned.